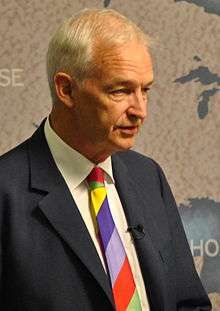 Jon Snow (born 28 September 1947) is an English journalist and television presenter, currently employed by ITN. He is best known as the longest-running presenter of Channel 4 News, which he has presented since 1989. Snow was born in Ardingly, Sussex, the son of George D'Oyly Snow, Bishop of Whitby, and his wife Joan, a pianist who studied at the Royal College of Music. He is a grandson of WW1 General Sir Thomas D'Oyly Snow (about whom he writes in his foreword to Ronald Skirth's war memoir The Reluctant Tommy) and is the cousin of retired BBC television news presenter Peter Snow. Snow won a choral scholarship by Winchester Cathedral, and spent five years at the Pilgrims' School. He grew up at Ardingly College, where his father was headmaster. In 2013, he recounted how the inquiry into Sir Jimmy Savile had allowed him to re-evaluate his own childhood when he was molested by one of the school's domestic staff. Snow subsequently attended St Edward's School, Oxford. When he was 18 he spent a year as a VSO volunteer teaching in Uganda. After mixed success in his first attempt to pass his A-level qualifications, he moved to the Yorkshire Coast College, Scarborough, where he later obtained the necessary qualifications to gain a place reading Law at the University of Liverpool. However, he did not complete his undergraduate studies, being rusticated for his part in a 1970 anti-apartheid socialist student protest, which he later described as "an absolute watershed in my life". After leaving Liverpool, Snow was hired by Frank, 7th Earl of Longford to direct the New Horizon Youth Centre, a day centre for homeless young people in central London, an organisation with which he has remained involved and of which he subsequently became chairman. He served as ITN's Washington correspondent (1983–1986) and as diplomatic editor (1986–1989) before becoming the main presenter of Channel 4 News in 1989. In 1992 he was the main anchor for ITN's election night programme, broadcast on ITV; he presented the programme alongside Robin Day, Alastair Stewart and Julia Somerville. (Previously ITN's programme had typically been presented by Alastair Burnet, who left ITN in 1991. The 1992 election night programme was the only one hosted by Snow. He was replaced by Jonathan Dimbleby from 1997 onwards.) He has won several RTS Awards – two for reports from El Salvador, one for his reporting of the Kegworth air disaster as well as the 1995 Award for Best Male Presenter and the 1980 Award for TV Journalist of the Year for his coverage of Afghanistan, Iran and the Middle East. While working as a journalist in Uganda, he flew alongside President Idi Amin in the presidential jet. He has recounted how whilst Amin appeared to be asleep he thought seriously about taking Amin's revolver and shooting him dead, but was worried about the consequences of firing a loose round in a jet aircraft. In 1976, Snow reputedly rejected an approach by British intelligence services to spy on his colleagues. At first he was asked to supply information about the Communist Party, but he was then asked to spy on certain "left-wing people" working in television. In return he would have received secret monthly, tax-free payments into his bank account, matching his then salary. In 2003, at the height of the "dodgy dossier" affair, Alastair Campbell walked into the studio to rebut statements by the BBC. Without notes or preparation, Snow attempted to question Campbell about the affair. In 2004, Snow published an autobiography, Shooting History. The book was published by Harper Perennial and details Snow's life from his childhood, up to the 2003 invasion of Iraq. He refuses to wear any symbol which may represent his views on air; in the run up to Remembrance Day, he condemned what he called "poppy fascism" because "in the end there really must be more important things in life than whether a news presenter wears symbols on his lapels". On 28 February 2008, Snow courted more controversy by claiming that the silence of the British media on the decision to allow Prince Harry to fight in Afghanistan was unacceptable, with the following statement: "I never thought I'd find myself saying thank God for Drudge. The infamous US blogger has broken the best kept editorial secret of recent times. Editors have been sworn to secrecy over Prince Harry being sent to fight in Afghanistan three months ago." These remarks provoked criticism from some viewers and media outlets. On 9 February 2009, Snow interviewed Lt-Col Yvonne Bradley, the military counsel for Binyam Mohamed, a British resident detained for five years at Guantánamo Bay. Snow asked whether Mohamed's allegations of torture were justified: Bradley said there was no doubt at all that he had been tortured. Mohamed was released and returned to Britain on 23 February 2009. On 14 June 2011, Snow presented the multiple award-winning investigative documentary Sri Lanka's Killing Fields, directed by Callum Macrae, which documented war crimes committed in the final days of the Sri Lankan conflict in 2009. The programme consisted of some of the most horrific footage ever broadcast in the UK; its second part, Sri Lanka's Killing Fields: War Crimes Unpunished was broadcast in March 2012. On 29 August 2012, Snow carried the Paralympic Torch in the relay prior to the opening ceremony of the 2012 Paralympic Games. In 2013, Snow had a dispute with broadcaster Charlie Brooker about video games in which Snow claimed the game Lego Marvel Super Heroes was violent. Later in the programme, Brooker referred to Snow as being "like a dog at the controls of a helicopter" when he was confused at how to control the character in the game. In early 2014, Snow conducted a heated debate with comedian and actor Russell Brand who appeared in a Channel 4 interview about his petition for a debate on British drug laws. Snow was also awarded the honorary degree of Doctor of Letters by Liverpool University in 2011 and again by Sussex University in 2015. He also became Honorary Director of Oxford Brookes in 2009 following his term as Chancellor of that University. In 1979 Snow was briefly engaged to fellow ITN journalist Anna Ford, by then ITN's first female newsreader on News at Ten. For 35 years his partner was human rights lawyer Madeleine Colvin, by whom he has two daughters. In March 2010 he married Precious Lunga, a Zimbabwe-born academic. Chair of the Heart of England Forest, the charity working to create a 30,000 acre connected woodland of native broadleaf trees. Currently 12% towards their final goal they are already England's largest new native forest. 1 2 Snow, Jon (3 May 2005). Shooting History. London: Harper Perennial. p. 352. ISBN 0-00-717185-4. ↑ "Jon Snow recalls childhood abuse". BBC NEWS. 25 February 2013. 1 2 3 4 5 "Jon Snow – Chancellor". Oxford Brookes University. Archived from the original on 2 March 2004. ↑ "BBC - Anniversary of student occupation". ↑ Turner, Shannon (28 December 1997). "How We Met: Jon Snow and Lord Longford". The Independent. Retrieved 1 August 2014. ↑ "Jon Snow - Personally Speaking Bureau". Retrieved 9 May 2015. 1 2 "Jon Snow Exclusive Interview". National Union of Students. Archived from the original on 26 November 2010. Retrieved 13 January 2011. ↑ Mark Hollingsworth; Richard Norton-Taylor (1988). "MI5 and the BBC – Stamping the 'Christmas Tree' files". Blacklist: The Inside Story of Political Vetting. London: Hogarth Press. p. 104. ISBN 0-7012-0811-2. ↑ Colin Wills (13 December 1998). "Interview: Jon Snow: I survived wars, Gadaffi and camel for lunch". Sunday Mirror. Retrieved 14 January 2011. ↑ Ed Vulliamy (25 March 1998). "Anthrax follies; 'Planted' intelligence is a war correspondent's nightmare". The Guardian. Retrieved 14 January 2011. ↑ "Channel 4 News at 25: Jon Snow". Channel 4 News. 31 October 2007. Retrieved 2 December 2009. ↑ Snow, Jon (2004). Shooting History. London: Harper Perennial. ↑ Jon Snow. "Snowmail: Prince Harry in Afghanistan". ↑ Andrew Pierce (29 Feb 2008). "Jon Snow attacked for praising Matt Drudge report on Prince Harry's deployment". The Daily Telegraph. ↑ "US lawyer: 'Show us Binyam Mohamed torture papers now'". Channel Four News. 9 February 2009. Retrieved 1 August 2014. ↑ "Cholera-hit Haiti braced for tropical storm Tomas". Channel Four News. 4 November 2010. Retrieved 1 August 2014. ↑ "Sri Lanka's Killing Fields - Sri Lanka's Killing Fields". Channel 4. Retrieved 2015-09-18. ↑ "Russell Brand v Jon Snow interview: Pair clash on Channel 4 over drugs". Metro. 2014-02-15. Retrieved 2015-09-18. ↑ "Russell Brand to Channel 4's Jon Snow; "Listen you, Let me Talk"". YouTube. 2014-01-18. Retrieved 2015-09-18. ↑ Nancy Banks-Smith (17 June 2002). "The hair apparent". London: The Guardian. Retrieved 13 January 2011. ↑ "BAFTA Television Awards 2015". BAFTA. Retrieved 20 July 2015. ↑ "University of Sussex Graduation Fri 17/07/15 (morning)". YouTube. 2014-07-10. Retrieved 2015-09-18. ↑ "News anchor Jon Snow's inspiring message to University of Sussex students". The Argus. Retrieved 20 July 2015. ↑ Kay, Richard (23 June 2010). "And finally, Jon Snow weds at 62 (and his new bride is just 35)". Daily Mail. London. ↑ "Fine words, now let's see some substance". Times Educational Supplement. Retrieved 30 November 2011. ↑ "Recently Retired Tate Trustees". Tate Gallery. Retrieved 14 January 2011. ↑ "Minutes of the Board of Trustees – March 2008". National Gallery. Retrieved 14 January 2011. ↑ "Jon Snow – Doctor of the University (HonDUniv)". Oxford Brookes University. Retrieved 13 January 2011. ↑ "Undergraduate Courses – Film & Media Studies". University of Stirling. Archived from the original on 25 October 2005. ↑ "RIBA announces 16 Honorary Fellowships". 29 September 2005. ↑ "Jon Snow new CTC President". Cyclists' Touring Club. 25 September 2006. Retrieved 1 October 2006. ↑ "Reprieve Update" (PDF). Reprieve. December 2007. Retrieved 13 January 2011. ↑ "Our People". African Prisons Project. Retrieved 25 March 2011. ↑ "About Us". Media Legal Defence Initiative. Retrieved 15 January 2011. ↑ "Who we are". Trees for Cities. Retrieved 12 February 2013. ↑ "Our Chair". New Horizon Youth Centre. Retrieved 12 February 2013. ↑ "Ambassadors". Ambitious about Autism. Retrieved 12 February 2013. ↑ "Healthtalkonline". Healthtalkonline main website. ↑ "Youthhealthtalk". Youthhealthtalk main website. ↑ "Healthtalkonline About Us". Healthtalkonline main website. ↑ "Jon Snow outlines vision for the Heart of England Forest".